Creating Touchable (interactive) Content with Microsoft PowerPoint – a free solution. Touch Screen Content? Use PowerPoint! With everyone owning a smart phone or tablet, touch screens have now become the norm. Customers frequently approach us to ask about installing a touch screen in their office for employees to access company information such as training videos, health and safety communications or compliance documents. What will the interactive function provide that other displays don’t? 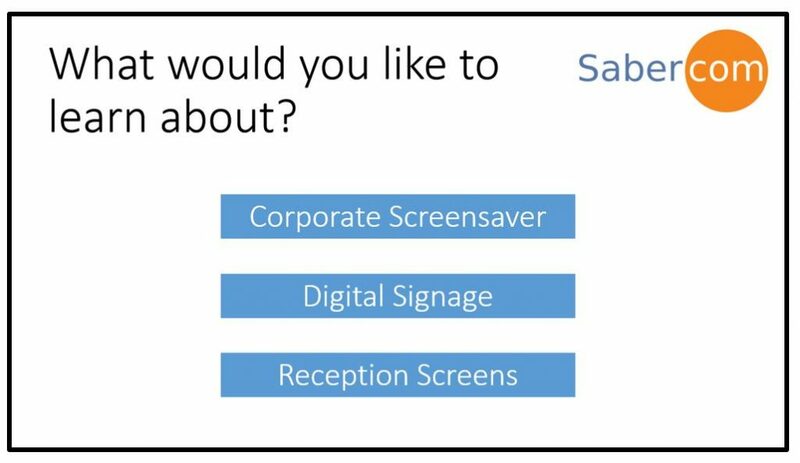 Is your audience likely to stop and interact with a screen in a public place? Who will be creating the touch screen content? In house or agency? How will the touch screen content be managed? The point I’m going to cover today is who will be designing the navigation buttons and what will show when each button is touched? A touchable navigation solution needs to be designed and content needs to be created. Updating content on a regular basis will prevent the touch experience from becoming ‘stale’. Purchase third party software for creating touch screen navigation experiences and learn to use it. Hire a creative agency to create a bespoke solution using HTML5 or similar code. Display an intranet page through a web browser for employees to touch navigate through – from our experience this works but is not a great interactive experience. Or, as this blog post title suggests, use Microsoft PowerPoint to create and manage content – an easy low cost way to get you up and running! 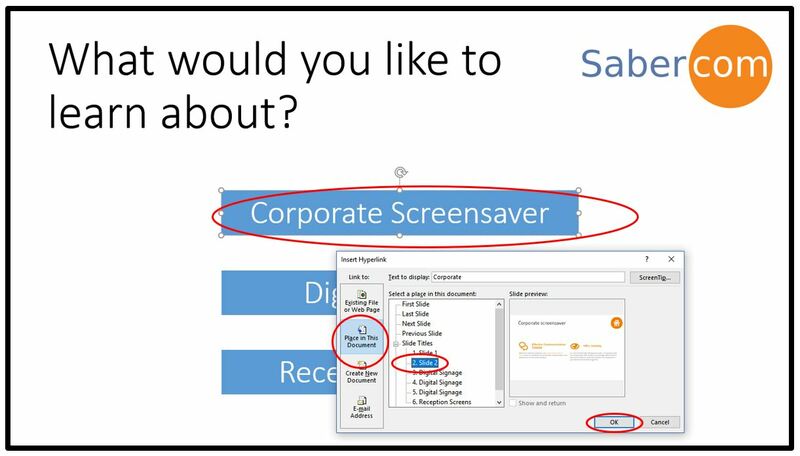 We’re going to assume that you have some knowledge of PowerPoint and have used PowerPoint to create a regular, linear, click-through slideshow. To create interactive content, we can use exactly the same process, the exception is we’re going to embed clickable (or in this case, touchable) buttons that can direct users to any slide within the presentation. The first slide will become your ‘Main Menu’ page and will contain images that will function as buttons. Subsequent slides will be where these image buttons link to, and each page will contain a ‘back’ (or ‘home’) button. Step 1 – Create a new presentation with the first slide designed with your branding. Add some text or images that will become touchable buttons. Below is a simple example using three of Sabercom’s products. Step 2 – Create three subsequent slides, one for each product or ‘button’. In this example, I’ve created a slide for each product. Right click on the first ‘Image Button’ that you would like to link. Chose ‘Hyperlink’ from the menu to bring up the ‘Insert Hyperlink’ dialog. On the left of this dialog – choose ‘Place in This Document’. You’ll then be presented with a list of all your slides. Select the name of the slide that you want to jump to. Then click ‘OK’. You can test that its working by starting the presentation and clicking through your buttons with a mouse. It’s important that users of the screen don’t get stranded, so you’ll need to add a home button to each and every slide! Simply hyperlink back to your starting slide 1. You will need to disable/untick the advance on mouse click under the transitions menu, otherwise, if someone touches the screen in a blank area, the presentation will advance to the next slide automatically. Clever use of imagery, photos and text can bring the whole presentation together. PowerPoint will allow you to embed video and other multimedia content which will enhance the touch screen experience. Unless you’re going for a retro feel, avoid the use of old-school transitions, sounds and animations. For more information about how Sabercom can help you and your business, or to arrange an online demonstration, please call us or fill out our contact form.